Volvo, the inventor of the three-point seat belt, urges you and all occupants of your vehicle to wear seat belts and ensure that children are properly restrained, using an infant, car, or booster seat determined by age, weight and height. The seat belts are equipped with pretensioners that reduce slack in the belts. These pretensioners are triggered in situations where the airbags deploy. The front seat belts also include a tension reducing device which, in the event of a collision, limits the peak forces exerted by the seat belt on the occupant. Pull the belt out far enough to insert the latch plate into the receptacle until a distinct click is heard. The seat belt retractor is normally "unlocked" and you can move freely, provided that the shoulder belt is not pulled out too far. Each seat belt (except for the driver's belt) is equipped with the ALR/ELR function, which is designed to help keep the seat belt taut. ALR/ELR activates if the seat belt is pulled out as far as possible. If this is done, a sound from the seat belt retractor will be audible, which is normal, and the seat belt will be pulled taut and locked in place. This function is automatically disabled when the seat belt is unbuckled and fully retracted. See also information about using a seat belt's ALR/ELR function to anchor a child seat. • The belt should not be twisted or turned. • The lap section of the belt must be positioned low on the hips (not pressing against the abdomen). • Make sure that the shoulder belt is rolled up into its retractor and that the shoulder and lap belts are taut. To remove the seat belt, press the red section on the seat belt receptacle. Before exiting the vehicle, check that the seat belt retracts fully after being unbuckled. If necessary, guide the belt back into the retractor slot. The seat belt reminder consists of an audible signal, an indicator light above the rearview mirror, and a symbol in the instrument panel that alert the driver and front seat passenger if their seat belts are not fastened. • Never use a seat belt for more than one occupant. • Never wear the shoulder portion of the belt under the arm, behind the back or otherwise out of position. Such use could cause injury in the event of an accident. • Seat belts lose much of their strength when exposed to violent stretching and should be replaced after any collision, even if they appear to be undamaged. 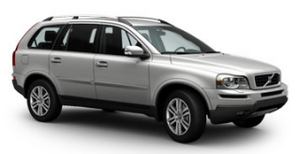 • Never repair the belt yourself; have this work done by an authorized Volvo service technician only. • Any device used to induce slack into the shoulder belt portion of the three-point belt system will have a detrimental effect on the amount of protection available to you in the event of a collision. • The seat back should not be tilted too far back. The shoulder belt must be taut in order to function properly. • Do not use child safety seats or child booster cushions/backrests in the front passenger's seat. We also recommend that children who have outgrown these devices sit in the rear seat with the seat belt properly fastened.